If you’ve ever owned a car, chances are you know how quickly it can get dirty. Whether you have pets, kids, or just everyday dirt and grime, vacuuming your car is important. Today we will cover several of the best car vacuums that will help you keep your vehicle clean. We’ve scoured the internet to find different options, so you don’t have to waste any more time trying to find what best suits your needs. Cleaning a vehicle should part of regular maintenance like changing your windshield wipers or changing your oil. 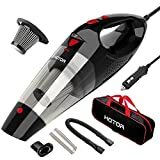 If you’re looking for the best handheld vacuum for cars, or maybe the best portable vacuum for cars so you’re able to clean up an unexpected mess on the go, or maybe you’re looking for the absolute best car vacuum cleaner, you will find an extensive pool to choose from below. Trying to find cleaning equipment can be quite the headache, especially when you have to go to several different stores, and compare prices and endless features. By reviewing the top 10 car vacs of 2019, we did the leg work for you to help make this one of the easiest purchases you’ve made. 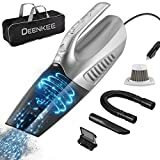 1 What Are The Best Car Vacuums Of 2019? 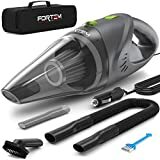 What Are The Best Car Vacuums Of 2019? There are a few things to consider when you’re about to purchase a new car vacuum. Depending on your needs, these things could change your options. Do you need a wet/dry vac? How about corded versus cordless? Do you need a car vacuum that has several accessories to help you clean up specific messes like pet hair? Whatever your needs, you’ll find a few different options on this list that could work for you. Below you will read about the top 10 car vacuums that exceed most users expectations. Whether you need a small, handheld vac that’s cheaper or if you need a larger vac with a lot of suction power to make sure your ride stays clean, you’re bound to find something that you can work into your life with ease. Depending on several factors, there are things that can affect your vacuum buying choices. If you live in an apartment building, you may need a cordless car vac if you don’t have access to any power outlets outdoors. If you have a pet that sheds a lot, you may need a specific brush attachment that helps clean up their fur. 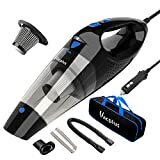 When reading these reviews, you will see what each specific vacuum is known for, their pros and cons, and top features. We have also looked at honest customer reviews from people who have purchased these products so we are able to give you a better review. You will be surprised to find how many vacuums will plug right into the lighter outlet in your vehicle. On our list below, you will see everything from cordless, handheld, and wall mounted, to vacuums used for specific clean-up jobs . Before making your purchase, consider your needs and see which car vac will work best for your lifestyle. If you’re looking for a vacuum that can get between your seats to remove food, dirt, or anything that may have fallen between the cracks, this may be the vacuum you’re looking for. ThisWorx vacuum plugs right into your cigarette lighter, not a wall outlet like most vacs. 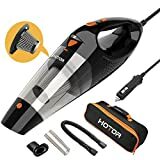 Not only is this vacuum great for cleaning up everyday messes, it works on both wet and dry grime and can even clean out your ashtray. The filter that comes on this vac is a HEPA design; meaning it can be washed right in your kitchen sink with the included cleaning brush, making for easy maintenance. HEPA Filterh: This vacuum comes with a reusable filter that’s easy to clean and safe for the environment. Filter cleaning brush is also included. Wet/Dry Capabilities: Not having to worry about buying multiple car vacuums for wet and dry clean up is great. This vac can clean up a liquid spill or mud from your boots all in one. 16-Foot Cable: With the long 16-foot power cable, you are able to clean small and large vehicles using minimal effort. It plugs straight into your cigarette lighter so you can clean on the go, even without a power outlet nearby. It comes with a 16-foot power cable to help you reach every spot no matter what size vehicle you drive and is packed with a 106-watt motor that offers powerful suction. This means you don’t have to worry about picking up small things, like wrappers or cigarette filters, before vacuuming. This vacuum will work well to pick up dirt and grime left behind by daily vehicle use. Since the suction is louder, this would be better if you lived in an area where the loud noise would be appropriate. It’s wet and dry capabilities and strong suction will make nearly any mess disappear. When it comes to trusted names in vacuums, Black & Decker is a name most people know. This vacuum was made with lithium technology, giving it a whopping 18-month battery life when it’s off the charger. With this type of battery, it’s equipped with what is called Smart Charge Technology, meaning that once it’s all charged up, it will automatically shut off. Users have found this vacuum reliable year after year and reach for it often. One of the best things about this vac is that it can be used on multiple surfaces, so whether you have leather seats or carpet in your vehicle, this vacuum should work for your needs. Washable Dirt Bowl: Cleaning out this vacuum couldn’t be easier. The dirt bowl is washable and can be done right in the sink with some soap and water. Cordless Power: You won’t need to be plugged in anywhere to use this product if it’s well charged before use. Easy To Empty: Vacuums can be a pain to empty, but this one you just twist off the front suction part and pour the contents into a trash bag or bin. If a futuristic vacuum that can clean multiple surfaces is for you, you may want to consider purchasing this one. Not only does the machine clean well, it’s easy for the user to clean as well. With it being cordless, you are able to use this vacuum on the go, which can be great for ride-share drivers or people who use their car more often than others. This bad boy is a mini car vacuum with a powerful amount of suction power. People have boasted about how lightweight it is and how great it is for on-the-go use. This Hotor car vac plugs right into your cigarette lighter for convenient use. With this vacuum, you will receive a carry bag, and you can clean during the day or night, as it’s equipped with an LED light. The power chord is 16.4 feet long, making it easy to clean even the largest vehicles. LED Light: A great addition that allows you to vacuum at any time and enables you to see into dark corners to get out all of the dirt easier. Powerful Suction: People who’ve purchased this product consistently talk about how great the suction power is, especially on pet hair. HEPA Filter: Comes with two stainless steel filters that you can wash in your kitchen, helping to save the environment by not wasting one-time-use filters. 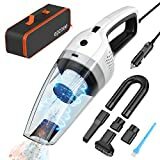 If you have a unique sleep schedule or find yourself with more free time in the evening, this vacuum may be the one you should purchase, since it comes equipped with an LED light making it easy for night time cleaning. This vac also has strong suction power to help clean up just about any mess in your vehicle. If you have a vehicle that has a lot of cracks and crevices to get into, you may like this vacuum. One of the main selling points of this vac is it’s pivoting feature, allowing you to get into all those harder-to-reach places. This vacuum is equipped with a 20-volt Max lithium ion battery, making the battery last longer and charge faster, which is a feature that works for everyone. Along with a great battery, another thing people who have purchased this vacuum boast about is the suction power. Lithium ion batteries make it so that no matter how full or low your battery is, the suction power doesn’t fade. Pivot Feature: One of the main purposes of this vacuum is so that you can get into all of the hard to reach places. The pivot feature provides that with a swivel head that adjusts to different angles. Crevice/Brush Tool: This additional tool assures you that every speck of dirt in all those forgotten about places. Lithium Ion Battery: The battery on this vac is built to charge quickly, last longer, and have consistent suction power throughout use. This vacuum is great if you’re wanting to get into all the little cracks and crevices other machines can miss. The pivoting head will make it easy to get to spots that are usually looked over or that other vacuums simply can’t reach. Equipped with a lithium ion battery, you won’t have to keep charging it after every use since lithium ion batteries are known to last longer. This vacuum comes with so many accessories so, however dirty your vehicle is, it should get clean after using it. Though bigger than any other on the list so far, this vacuum won’t take up much room, seeing as how you are able to mount it to any wall in your garage or home. It comes with a 32-foot hose that makes getting all around the interior of your car or truck easy. With that being said, you could clean your vehicle several times before you’d need to empty out the whopping 4-gallon dirt tank this vacuum has. You will be able to use this on wet or dry messes, whether that’s spilled coffee or a snack that got knocked over. Plus there is a blower option available on the machine that could be helpful. Wet/Dry: You can use this no matter what kind of mess you’re picking up, whether it’s liquid or dry. 4-Gallon Tank: You don’t have to empty this after every use or even multiple times during use like some of the others on this list. 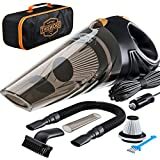 Car Detail Attachments: This vacuum/blower comes with seven different car attachments making it that much easier to get every detail of your car spick and span. It’s hard to go wrong with a vacuum that comes with 7 attachments that will help to get just about any job done. You won’t have to worry about cleaning out the dirt tank after every use, seeing as how it holds 4 gallons and has an indicator on the side that shows you how full it is. Lastly, the wet and dry capabilities assure you that no matter the mess, it can get cleaned up when using this vacuum. When most people hear the word Dyson, they probably think something along the lines of “quality” or “expensive”. Dyson is known for their vacuuming products, and this one was created specifically for car and boat cleaning. Suction: Noted as the most powerful suction of any handheld vacuum, Dyson mentions this vacuum will pick up any dirt or grime in your vehicle without worry about suction power fading for the first 30 minutes of use after charging. Extension Hose: The extension hose makes it easier to clean hard-to-reach places in your vehicle. Mini Motorized Tool: This additional tool allows you to easily pick up things such as dirt on your floor mats or pet hair on your vehicle’s carpet or seating. Combination Tool: This tool allows you to clean up hard-to-reach crevices and additionally helps to dust things like your dashboard or entertainment console. Car Charger: With the additional car charger, you will be able to keep this vacuum in your car or charge it while you use it. With a name like Dyson, you know you’re going to get a good product. This vacuum comes with multiple additional tools to get jobs done, like dusting your dashboard as well as vacuuming up dirt. If you need a wall charger and a car charger option, this may be the vacuum for you. It is smart to keep in mind that this vac comes with a hefty price tag and can be a bit bulky. Like most people, you’re probably wanting to remove things like dirt, lint, pet hair, and unwanted mess from your car’s interior. If that’s the case, this vacuum claims to clean all of those things right up. The Fypet car vacuum has a 12-volt battery and is great for cars, trucks, or SUVs. It has a 360-degrees cyclonic design, making it easy to get into the harder-to-reach places in any vehicle. Equipped with a 16.4-foot power cord and a suction power of 5000PA, any car you own will be clean after using this. You will be able to use this on wet or dry messes, and one of the best parts is that the brush head has high-speed pivoting, which is unlike most vacuums on this list. Lastly, you have the typical washable filter to make cleaning even easier. LED Light: Having an LED light when vacuuming makes getting into dark crevices that are usually missed a much easier job. You could also incorporate this feature by using the vacuum during the day or the evening hours. Pivoting Brush Head: With a pivoting brush head, you are able to clean practically every inch of your vehicle without having to worry about any dirt or grime left behind. Suction Power: This bad boy is equipped with 5000PA suction power. The strong suction allows you to pick up almost any mess with this vacuum without power fading. When doing research for this review, it was hard to find any cons to write about. At the time of writing, there were 120 reviews, all being 5 stars. The pivoting brush head will get to all parts of your vehicle’s interior, accompanied by the incredibly powerful 5000PA suction power. Again, this vacuum comes with an LED light, making it useful to see into dark cracks or for evening use, if that works better for you. 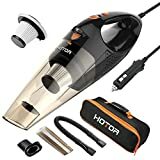 From the name of this vacuum, you are able to know that it works on wet and dry messes like a few of the others on this list. Vacmaster themselves claim that it is “designed to tackle the toughest cleanup projects”. There is an on-board hose and storage for accessories and the power cord, which saves you space. The power cord is 18 feet long, which is the longest one on the review so far. The hose is seven feet long, giving you plenty of reach to get your entire car’s interior. Suction Power: This vacuum is packed with suction power, which helps to pick up most anything that’s making your car interior filthy. Attachments: There are plenty of attachments included with this vac that can help with specific cleanup projects such as dirt, pet hair, or food spills. 18-Foot Cord: The longest cord on our review yet will make cleaning any size vehicle that much easier, since you won’t have to re-plug it over and over to reach all sides of your car. 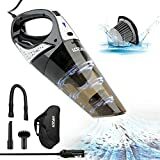 Seven-Foot Hose: On the same note as the long cord, the seven-foot hose this car vac comes with will have you cleaning and reaching all the necessary spots with ease. This vacuum has the longest power cord of all of the vacuums reviewed, which could be what sells you. It comes with several attachments that can help clean up just about any mess. One of the biggest selling points for customers is the high suction power that the vac has. The seven-foot hose makes it so you won’t have to work too hard to clean up the interior of your car. This is another vacuum that has a lot in the name. With this Bissell vac, you will be able to clean up any sign that your furry friend was in your car. It removes embedded dirt on your seats or car floors and will get any stray pet hair too. This vacuum is cordless, which makes for easy travel and convenience while using. This is another vac that has a 14-volt lithium ion battery so you can get a longer lasting clean with a longer fade time. They do list on their product description to specifically not pick up or use this vacuum near anything that is flammable or could combust like lighters or gasoline. Easy To Clean: You become the vacuum cleaner when rinsing out the filter and dirt trap area. All you need is a sink and some soap and water. Cordless: You won’t have to worry about being near an outlet when using this cordless car vac. Since it’s cordless, you won’t have to watch your step to not trip over a cord, plus you can really get in any area of your vehicle without being held back by cord length. Triple Level Filtration: With the triple level filtration system built into this vac, you know you are getting a cleaner car while using it, and it will improve the overall clean of your vehicle. Pet Cleaning Tools: If you have a Fido or Garfield in your life, the set of three pet cleaning tools will help make sure that any hair or embedded dirt is cleaned up well. This review talks about it a lot and for good reason: this vacuum may be the one you want to consider purchasing if you’re a pet owner and have your furry friend in your vehicle a lot. Not only does it come with three tools specifically for cleaning up after pets, but it’s cordless and incredibly easy to clean after using. It’s the only vacuum on this list that has triple-level filtration, helping with the overall cleanliness of your car. Small but mighty, this is one of the best car vacuums since it has a powerful 120-watt motor, which allows for extra strong suction power. Most handheld car vacs are 80 watts or less. This vacuum was specifically made to clean any car and to do so more easily than others on the market. You are able to use this to clean wet or dry messes, and it won’t cause any issues. There is a longer power cord on this vac, allowing you to reach all of the places in your vehicle that need cleaning. Like most other car vacuums on this list, it is equipped with a removable HEPA filter so you can reuse and easily clean when needed and extend the life of the filter. Every vacuum also comes with a spare filter so you won’t have to spend more money down the road. Lastly, it comes with a one-year warranty. 120-Watt Motor: Like stated earlier, this powerful motor creates a powerful suction, allowing you to clean up your car interior easier and quicker than others on the market. One-Year Warranty: With a one-year warranty, you will feel safer purchasing this vacuum, knowing that you can get a replacement or a return for the first 365 days. Multiple Attachments: This vacuum comes with different attachments you can use for whatever you’re cleaning up. There’s a brush to help pick up pet hair, or you could use the wide-mouthed hose to clean up bigger messes such as piles or spilled food or dirt. If you’re looking for a smaller vacuum that packs a punch, consider purchasing this last vac. With a 120-watt motor, it will be hard to find a handheld vacuum that can compete with the suction power this one carries. And with the warranty, you will be covered if you feel like you don’t like your purchase within the first year. Lastly, there are multiple attachments, making any cleaning job easier. Now that you’ve read what you need to consider before purchasing a vacuum for your car, there are some additional standard features to know about that should come with each vacuum. You want a vacuum that, if cordless, can hold a long battery charge and doesn’t have a suction that fades in power over the course of using it. Another standard feature can be a reusable filter, which not only makes for easier clean up for you, but is also good for the earth and your wallet. Having a cordless vacuum is the ultimate convenience. You are able to physically get into your vehicle and reach every spot you’re wanting to clean. There isn’t a long cord to work around and avoid tripping over. Having a cordless vacuum means that when charged, it’s portable. You’ll be able to keep it in your car and use it daily or whenever an unexpected mess is created. Having a long battery life pertains to cordless vacuums, since you won’t receive your power from being consistently plugged into a power source. A long battery life means you won’t have to stop vacuuming part-way through to charge your vacuum. Suction power is one of the main selling points of vacuums, whether you’re using it in your car or elsewhere. If a vacuum has poor suction, it will take more work on your end to get the mess cleaned and usually will take more time as well. In addition to having powerful suction, you may want to make sure that it doesn’t fade over time. If you’ve ever been using a cordless vacuum and notice that it starts out strong but towards the end of the battery charge, it starts to fade in power. You will see a few vacuums that have a longer, fade-resistant life than others in the reviews below. Having a vacuum that is easy to clean after use is half the battle. In the reviews below, you will see how easy each vacuum is to clean and what that will entail. Most of them have reusable filters and dirt trays that you can clean with soap and water at your kitchen sink. You might be looking at features that don’t come standard on most car vacuums. These reviews are convenient since there are such a variety of product features. One of the most popular additional features is a wet/dry capability. A lot of these vacuums come with that, but not all, so read carefully. Lastly, not every vacuum comes with additional brushes and tools, but we cover which ones on the list do and what those tools are. After going over the top 10 best car vacuums, you should be well versed on the main and additional features that most vacuums have. Whether you prefer a cordless vacuum that’s easier to clean or one that you mount to the wall with a large dirt trap that you’ll have to clean less often, there’s likely something on this list for you. Whether you’re cleaning up after pets and children, you work for a ride sharing company and need a tidy car, or you’re just looking for something to clean up every day dirt and dust, there’s a car vac on the market for any of your needs.